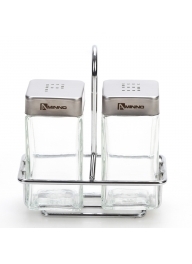 Aminno 3 Pieces Glass Salt and Pepp..
Aminno 3 Pieces Glass Salt and Pepper Set in Holder - Transparent Brand: AMINNO Nam..
AMINNO Salt & Pepper Glass Shakers ..
AMINNO Salt & Pepper Glass Shakers with Stainless Steel Lid Elegant salt and pepper s.. AUTUMN GERMANY Bread Bin Set - Brea.. AUTUMN GERMANY Bread Bin Set - Bread Box & 3-Canister Set Bread Box All materials..
3 Glass Jar Set Condiment Jar Kitch..
3 Glass Jar Condiment Set Kitchen and Dining Table Utensils Air-tight storage Keep ..
Set of 3 Canisters with Bamboo Bas..
Set of 3 Canisters with Bamboo Base This 3 canisters set will add beauty to your ki..
AMINNO Salt and Pepper Glass Shaker..
AMINNO Salt and Pepper Glass Shakers Adjustable Holes with ABS Plastic Lid and Stan..
Set of 6 Ceramic Condiment Cruets with Bamboo Rack Pepper Salt Spice Shakers of Wooden Covers Kit..
Hexagonal Beverage Dispenser 9000 m..
Hexagonal Beverage Dispenser 9000 mL with Cap Spigot Shelf and Rubber Gasket H..
Beehive Beverage Dispenser 10000 mL..
Beehive Beverage Dispenser 10000 mL with Cap Spigot Shelf and Rubber Gasket Be..
AMINNO Oil & Vinegar Cone 2 Glass C..
AMINNO Oil & Vinegar Cone 2 Glass Cruets with ABS Plastic Caps & Stand Eye catchi..
AMINNO 4-Piece Condiment Set - 3 Ca..
AMINNO 4-Piece Condiment Set - 3 Canisters with 3 Spoons & a Stand Classical square s..
Aminno 1 Piece Glass Herb Keeper 13..
Aminno 1 Piece Glass Herb Keeper 13.97cm x 13.97cm x 30.48cm - Transparent Keep herbs lik..
2-Piece Tupperware Set 3-Slot Tuppe..
2-Piece Tupperware Set 3-Slot Tupperware Food Container Lunchbox (D18 x H5)cm This tupper..
Small Mouse Heated Mini Water Dispe..
Small Mouse Heated Mini Water Dispenser Serves Up 8 Glasses Of Water - Purple Cute d..
Hexagonal Beverage Dispenser 6000 m..
Hexagonal Beverage Dispenser 6000 mL with Cap Spigot Shelf and Rubber Gasket .. Decorative Ceramic Cruet Set Gravy .. Decorative Ceramic Cruet Set Gravy Boat with a Metallic Base Kitchen Utensil Dining-Table Ornamen..
ARSTO 3-Piece Set Vacuum Preserving..
ARSTO 3-Piece Set Vacuum Preserving Box Round Shape Vacuum Food Container Features: U..
6-Piece Water Dispenser Set Ceramic..
6-Piece Water Dispenser Set Ceramic Water Jar & 4 Cups with Bamboo Base Ceramic crock..
7-Piece Ceramic Canister Set Elegan..
7-Piece Ceramic Canister Set Elegant Floral Pattern Brings bright floral patte..
Air-Tight Glass Decanter Capacity 8..
Air-Tight Glass Decanter Capacity 800mL Unique square top prevents rolling when horizonta..
Two Pieces Ceramic Salt & Pepper Sh..
Two Pieces Ceramic Salt & Pepper Shakers with Bamboo Base Dining Table Utensil Salt a..